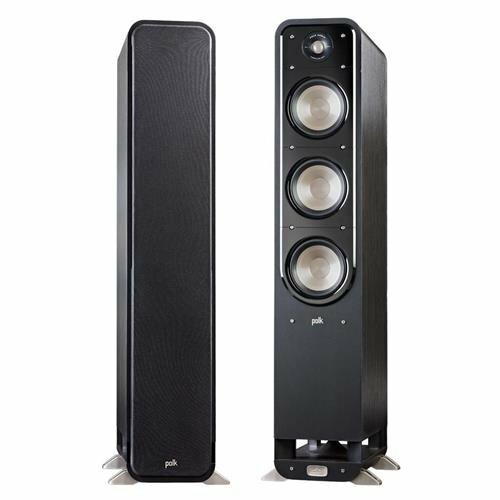 The Polk Signature S60 tower speaker is built to bring the big surround sound theater and music experience into the comfort of your living room. It also features Hi-Res certification, a new Dynamic Balance designed acoustic array, precision cross-overs, an anti-diffraction grille, modern cabinet styling and exclusive Power Port bass enhancing technology. With the S60, you get elevated sound for movies, TV and music in a totally re-imagined design. Dynamic Balance is a patented technology that analyzes the speaker's entire electro-acoustic and mechanical system for improved material selection and more efficient geometry. It pinpoints and eliminates issues that reduce speaker performance before they become a part of the finished product. The newly designed Terylene dome tweeter features curvilinear formers that extend response and lower resonance. It's powerful ceramic motor structure also lowers system resonance and extends low frequency response for better dispersion in the critical midrange, delivering clear and detailed high frequency response for realistic reproduction of vocals and instruments. It's capable of delivering 40kHz to support the latest high resolution audio files. Power Port is the patented design from Polk that smoothly transitions the air flow from the speaker's port into your listening area and offers 3dB more bass response output than a traditional port.